A woman places a flower at the Erawan shrine, the site of Monday's deadly blast, in central Bangkok, Thailand, Aug. 20, 2015. Thai officials say this week's deadly Bangkok shrine bombing was likely planned by at least 10 people, including some foreigners, but is not believed to have been carried out by an international terror group. "The incident is unlikely to be linked to international terrorism," said Colonel Winthai Suvaree, a spokesman for the country's ruling military, in a televised statement Thursday. He also said "Chinese people were not the direct target" of the late Monday attack at the Erawan shrine, which was popular with Chinese and other foreign tourists. Late Thursday, officials in Bangkok told reporters that two of the suspects turned themselves in for questioning, saying that they were not involved in he bombing. But few other details were immediately available. Earlier, National Police Chief Somyot Poompanmoung said at least 10 people were involved in planning the attack, which killed at least 22 people and injured hundreds more. He said the group likely planned the bombing about a month in advance. The government on Wednesday issued an arrest warrant for and released a sketch of a foreign man they believe carried out the Monday attack on the Erawan shrine. Thai police released this sketch of the bombing suspect August 19, 2015. 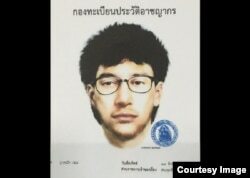 ​The police drawing depicts a young man with black shaggy hair, stubble, and round, plastic-framed glasses. There is a $28,000 reward for info leading to his capture. The tall, slender young man wearing a yellow t-shirt was seen in security camera footage calmly walking away from the shrine after leaving a backpack under a bench, just before the blast. Police officials say at least two other men, one wearing red and another wearing white in the CCTV video, are also suspects in the attack. Major General Apichart Suriboonya told the French news agency on Thursday the Thai government will seek the help of Interpol in hunting down the suspects. No motive for the attack has been determined. It is also not clear whether any of the suspects have fled the country. The Thai prime minister has said it could be politically motivated, aimed at damaging tourism or the economy. Other officials have suggested various theories, including elements behind Thailand's divisive political factions, Uighurs upset at Thailand's decision to deport more than 100 Uighurs to China last month, or militants from the country's southern insurgency. 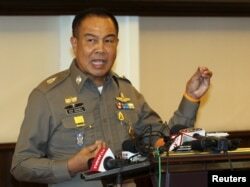 Thai national police Chief Somyot Pumpanmuang speaks during a news conference at the Royal Thai Police headquarters in central Bangkok, Aug. 20, 2015. Thai security agencies are "examining all leads and clues" and have not ruled out any possibility, according to Panitan Wattanyagorn, an advisor to Defense Minister and Deputy Prime Minister Prawit Wongsuwong. When asked whether the bombing involved Uighurs, Panitan told VOA that officials have been monitoring "various groups." "So far [we have found] nothing unusual on these groups. Until and unless we are now able to get the full [identity] of the suspects, there's no conclusion on a particular group yet," he said. John Blaxland, a senior fellow at the Strategic and Defense Studies Center at the Australian National University, said there remains little clarity over who may have been responsible. “There’s a spectrum of scenarios of moderately to quite plausible of who might have been the instigator. None of them are watertight, though it really means that there’s a lot of work to be done on terms of following up who might have been the perpetrator,” he said. Thailand's southern Muslim insurgency has killed more than 5,000 people during the past decade, but militants have rarely struck outside the border regions. The military government says the type of bomb used in the attack has not indicated that southern militants were involved. Chris Baker, a commentator and author on Thai politics, said groups within Thailand’s bitter political divide also may have had motive. Analysts have also suggested that internal divisions in Thailand's military government may be behind the attack, for reasons that remain unclear to the general public. For now, with little idea of who was behind the attacks, Bangkok remains on edge. Since Monday's blast, another bomb exploded Tuesday near a transit station in Bangkok’s riverside, but caused no injuries. A suspicious package found on a street shut down one of Bangkok's main downtown thoroughfares on Wednesday, but police later determined it was not a threat. A woman prays at the Erawan Shrine at Rajprasong intersection the day after a deadly explosion in Bangkok, Thailand, Aug. 19, 2015. Chris Baker said if there are no further attacks the impact of Monday's bombing over the longer term will recede. But further bloodshed would have major consequences. In recent months Thailand has relied more heavily on its important tourism industry, as exports slumped and the currency weakened. Following the attack, the Thai baht has slumped to a six-year low against the U.S. dollar. Tour operators are confirming immediate cancellations by those too frightened to travel to the kingdom. VOA's William Gallo contributed to this report.